RIGGER RAMBLINGS: The Calgary Roughnecks begin a double-header weekend tonight as they get set to battle the San Diego Seals at the Pechanga Arena. They will then take on the Colorado Mammoth on Sunday, Jan. 20, at the Pepsi Centre. 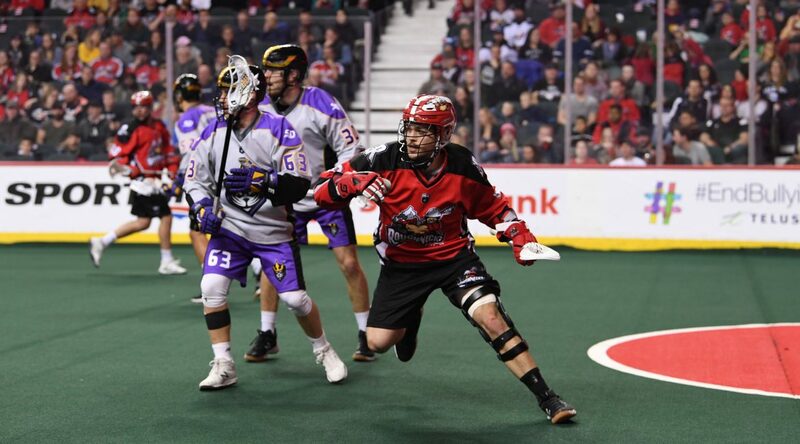 Calgary was last in action on Jan. 12 when the New England Blackwolves snapped their three-game winning streak with a 16-10 victory at the Scotiabank Saddledome. Seth Oakes (1g, 2a) opened the scoring for the Blackwolves who jumped out to a 6-2 first quarter lead. Stephan Leblanc (3g, 6a) led the way for the visiting team with nine points while Callum Crawford (2g, 6a) and Reilly O’Connor (4g, 2a) also made big contributions. Dane Dobbie was Calgary’s leading offensive performer, scoring four goals and adding three assists. Ryan Martel and Chris Boushy netted a pair of goals each while Dan Taylor (1g) and rookie Reece Callies (1g), with his first NLL career goal, rounded out the scoring for the Riggers. San Diego is 1-0 at home while Calgary is 2-0 on the road. SAN DIEGO: Tonight marks the second of three regular season meetings between the Roughnecks and Seals. San Diego, which was awarded an NLL expansion team in August of 2017, has begun their inaugural season with a 2-2 record, including a 12-10 victory over the Rochester Knighthawks in their home opener last Saturday. The two West Division rivals don’t meet again until Saturday, Mar. 30 when the Roughnecks host the Seals at the Scotiabank Saddledome. ROUGHNECKS MONTH-BY-MONTH: December (2-1), January (1-1). ROUGHNECKS VS.: (BUF 0-0), (COL 1-0), (GA 0-0), (NE 0-1), (PHI 0-0), (ROC 0-0), (SD 1-0), (SAS 0-0), (TOR 0-0), (VAN 1-1). SUPERMAN RETURNS: On Jan. 12 the Roughnecks signed 30-year-old forward Curtis Dickson to a multi-year contract. Dickson is entering his ninth season in the National Lacrosse League, all with the Roughnecks. He joined the franchise in the 2010 NLL Entry Draft after being selected by Calgary in the first round, third overall. The Port Coquitlam, British Colombia product sits third all-time in franchise scoring with 641 points (360 goals, 281 assists) in 138 career games. ROOKIE SPOTLIGHT: Forward Chris Boushy has tallied at least a point per game in his inaugural season after scoring his first NLL point with a goal and an assist in Calgary’s home opener on Dec. 15. The 21-year-old has six goals and four helpers in five contests this season. Drafted by the Saskatchewan Rush in the third round, 31st overall, in the 2017 NLL Entry Draft, Boushy spent the 2018 season with the Burlington Chiefs of the OJALL. He recorded 84 points (36g, 48a) in 18 games. WE MEET AGAIN: Tonight marks the second meeting between the Roughnecks and their former teammates, goaltender Frank Scigliano and defenseman Garrett McIntosh, after both players were picked up by San Diego in the 2018 NLL Expansion Draft. In their last match up on Dec. 28, Scigliano was the third star of the night making 49 saves with 58 shots on goal while McIntosh scooped up three loose balls and caused two turnovers. ‘NECKS NOTABLES: Alternate captain Dane Dobbie leads the league in goals with 15 and in shots with 98. Last season the forward became the franchise’s all-time leading scorer finishing the season with 751 points (371g, 380a) in 160 contests to surpass the previous mark of 684 set by now-Rush forward Jeff Shattler. Dobbie is also creeping up on Shattler’s franchise record of 416 assists; he currently has 395 helpers in 165 career games. SPECIAL TEAMS WATCH: Calgary’s power play is fourth in the NLL at 46.43% The penalty kill is sixth in the league at 57.89%. LADYCROSSE IS BACK: The Calgary Roughnecks are proud to present Ladycrosse on February 3 at the Scotiabank Saddledome. Women aged 18 and over are invited to join us for a fun-filled morning learning directly from the Roughnecks players and coaches on the ‘Dome turf. The Roughnecks will be teaching basic lacrosse drills, training routines, and rules of the game. Afterwards, all ladies are invited to mix & mingle with the players and coaches while enjoying a brunch buffet served in the Chrysler Club. Ladycrosse registration along with full event details can be found here. DEL BIANCO’S ASSISTS FOR KIDS: On Dec. 15, Roughnecks goaltender, Christian Del Bianco, and the Roughnecks Foundation proudly announced a new charitable program, Del Bianco’s Assists for Kids presented by Ascent Consulting Ltd. The partnership will see both Del Bianco and the Calgary Roughnecks Foundation direct $30 each while Ascent Consulting Ltd. donates $500 for every regular season assist recorded by the Calgary goaltender. In addition, Del Bianco is auctioning off his helmet on ElevateAuctions.com, which features the KidSport logo. Auction details will be communicated in the new year. Del Bianco tallied 17 assists during the 2017-18 regular season and hopes to increase his point total this year. MILESTONE MARKERS: On Jan. 12, Tyler Burton and Greg Harnett both played their 100th NLL career game while rookie Reece Callies recorded his first NLL goal on the same night. On Jan. 6, first round draft pick in 2018 Shane Simpson tallied his first NLL career point with a goal and two assists while Chad Cummings eclipsed 150 loose balls. On Dec. 28, Dan Taylor eclipsed 50 NLL career points while rookie Reece Callies recorded his first NLL career point with an assist. On Dec. 21, Rhys Duch surpassed 900 NLL career points and rookie Eli Salama recorded his first NLL career point with an assist. On Dec. 15, Dan MacRae eclipsed 600 loose balls while Chris Boushy recorded his first NLL goal and assist on the same night. THE ROAD AHEAD: The Roughnecks continue their double header weekend on Sunday, Jan. 20 when they face off against the Colorado Mammoth in a 1:00 p.m. matinee at the Pepsi Center. Week 7 is a bye-week for the Riggers before they return home for a matchup against the Vancouver Warriors on Feb. 2. Game time is 7:00 p.m. at the Scotiabank Saddledome.